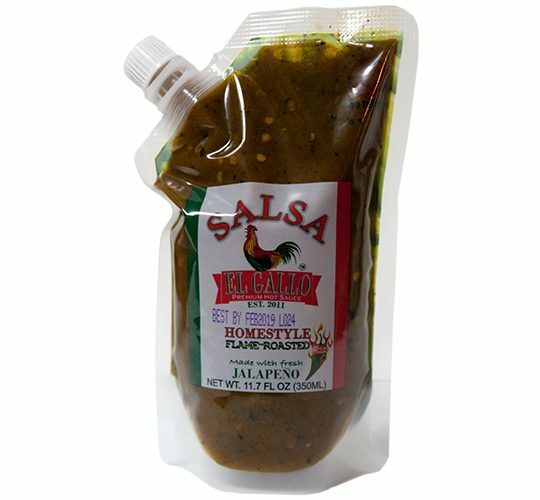 Salsa El Gallo Homestyle also comes in Fire-Roasted Green Jalapeño Salsa. This salsa is a perfectly balanced mid-level heat that hits your taste buds just right. It’s an essential topping for your meal. If you’re looking for a new “secret ingredient”, add this salsa as a cooking base! Give us a try next time you are preparing a dish or having friends over and want to add authentic South Texas style flavor. Ingredients: Jalapeño, tomato, garlic, salt. This salsa is a perfectly balanced mid-level heat that hits your taste buds just right. It’s an essential topping for your meal. If you’re looking for a new “secret ingredient”, add this salsa as a cooking base! Give us a try next time you are preparing a dish or having friends over and want to add authentic South Texas style flavor.